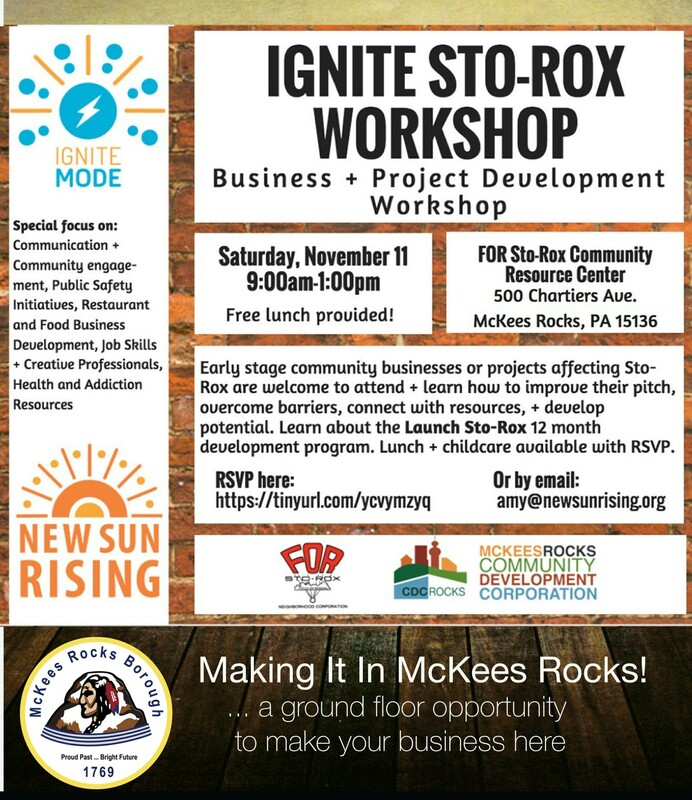 Over the past year, McKees Rocks Community Development Corporation and Focus on Renewal have partnered with social innovator New Sun Rising to bring its multi-step program to potential business owners interested in setting up shop in the Sto-Rox area. New Sun Rising’s programs and services are designed to build social impact and economic opportunity in communities like ours. MODE allows early-stage community businesses or projects affecting the Sto-Rox region to learn how to improve their pitch, overcome barriers, connect with resources and development potential. The social innovation program is delivered through four channels: ignite, launch, grow and arts. These vehicles strategically progress your idea from ignition of concept at mentoring workshops, to launch via a 12-month incubation with fellow social innovators, and to grow with management services and funding to amplify your impact and sustainability. The first of several business development workshops geared toward communication and community engagement, public safety initiatives, restaurant and food business development, job skills, creative professionals, and health and addiction resources is set for Saturday, Nov. 11. WHEN: Sat., Nov. 11 | 9 a.m. to 1 p.m.